Bill Gates recently said "the robot industry is akin to the PC industry 30 years ago" and predicted that we will soon have "a personal robot in every home." Robots are having a significant impact on our daily lives and beyond, from autonomous cars driving on our highways to robotic vacuum cleaners in our homes to robotic surgery in our hospitals. The objective of this course is to provide a hands-on introduction to robotics, with an emphasis on the computational and algorithmic aspects. The course will focus on algorithms that enable robots to effectively make use of sensory information from the environment and purposefully act upon it. 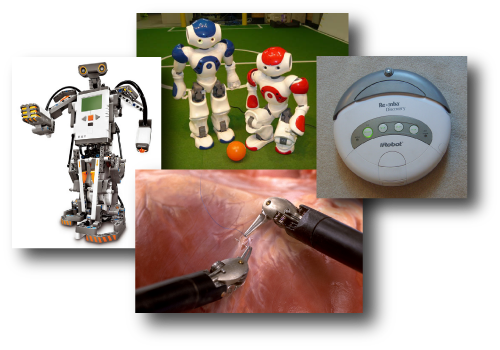 Topics to be covered include robot kinematics, inverse kinematics, actuation, sensing, manipulation, control, and motion planning. The course will also discuss applications to personal assistance, autonomous vehicles, medical surgery, manufacturing, games, and other areas. The course will feature a combination of lectures, assignments, and hands-on lab experiments. Students will have the opportunity to build, program, and test increasingly complex mobile robots using robot kits, culminating in an end-of-semester robot contest. Who should enroll: Students with interests in robotics, motion planning algorithms, physics, engineering, computer vision, and graphics, as well as application areas such as those listed above. Grading: 60% assignments/labs, 30% exams, 10% participation. Prerequisites: Fundamental programming skills in Java and data structures (COMP 401 and 410 or equivalent).